Baby "stuff" is like speaking a special language. I vividly remember going to Target to fill out my baby registry and feeling extremely overwhelmed. I had no clue what I needed. Over the last year I've slowly learned what I like and don't like. Certain brands in particular have ended up being my favorites. I can always depend on these companies to produce something I love and I'll forever be a loyal customer to them because of it. It doesn't matter what it is, if this company makes it, I'll love it! I've said many times before how much I love Aden + Anais. Every product of theirs that I've ever tried, I've loved. I received so many of their swaddle blankets as gifts and they look so pretty rolled up in a basket in Campbell's room. The easy swaddles saved my life when Campbell was an itty bitty baby and the sleeping bags keep him warm and cozy every time he goes to sleep. I will keep Campbell in his sleeping bags until he grows out of them....which I'm guessing will be another year (tear). I have many different products of theirs and I love them all! When Campbell and I snuggle on the sofa together, I always grab his dream blanket to cover us both up! It's so soft and cozy and big enough for us to share!! Toys have taken over our house these days!!! 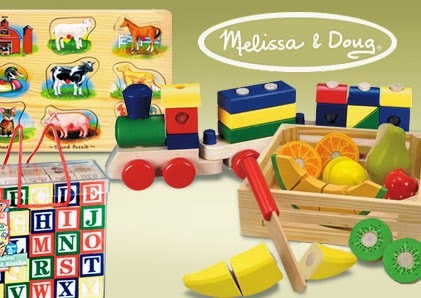 I love the Melissa and Doug toys. They're just so classic and cool. It's what I imagine my parents played with when they were little tots! I'd like to think I'll resist my need for no clutter and put a few of these toys in a box to save so my grandchildren can play with them one day. Skip Hop is one of my newer loves. They have the cutest stuff!!! Campbell has the dinosaur backpack and matching lunch box and uses them every week for Mothers Day Out. We also love their bowls and straw cups. The Easter Bunny got Campbell an insulated food jar for him to use at MDO. It keeps food cool or warm for many hours and I'm so excited about it because I'm no longer limited to food options to send with him. Over the weekend I discovered their snack cups and I think it's brilliant. I always have a snack cup with the no spill lid and while it does it's job keeping the puffs and cheerios from spilling, I always have crumbs on the bottom of my diaper bag. It drives me crazy!! The Skip Hop snack cup has a lid that snaps shut and was specifically designed to keep crumbs out of mom's bag. All of their items are just the cutest. I want one of everything! I just absolutely adore Kickee Pants. It's literally the only thing Campbell sleeps in. I loved them before I even had a baby or was even pregnant with one. They're just the most amazing thing ever and I've appreciated their goodness for years and years. It's the first item I bought when I found out I was having a boy. I was dying to own some but wanted to wait until I knew if I was having a boy or girl. After our ultrasound told us we would be having a precious baby boy, I drove straight to one of my favorite baby boutiques in Fayetteville to get Campbell his first pair. I follow them on IG and whenever they announce their new line, I immediately get online to check it out. My obsession is possibly overboard but I don't even care. I love 'em!